Blurb It's black, looks mean, is made of plastic and plugs into your Spectrum. It promises a new kind of fun and isn't cheap. It's the new Sinclair Magnum lightgun, and MIKE DUNN is the man with his finger on the trigger. Notes Different versions for the 48K, +2 and +3. Came with the Sinclair Action Pack - Lightgun Games tape/disk. 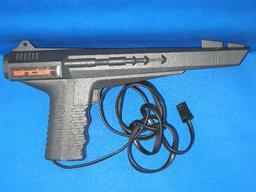 Also see the special promo packs ZX Spectrum +2 Action Pack and ZX Spectrum +3 Action Pack.